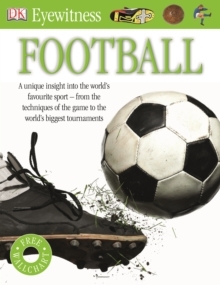 The ultimate guide to football for today's internet generationJust in time for FIFA World Cup 2014, the reissue of Eyewitness Football will help your child learn everything they want to know about 'the beautiful game'. Revised and updated with stats from the 2010 World Cup tournament, plus an exciting new cover. They'll become a footie aficionado with this premier guide to the world's favourite sport, it's history, tactics, teams, superstars and supporters. Packed with fun facts, from why gloves make a goalkeeper's job easier, to why heading a ball in the 1870s could be deadly. Eyewitness Football also includes a giant fold-out wall chart full of facts, perfect for bedrooms or classrooms. Great for projects or just for fun, Eyewitness Football has been updated with fresh images and information to help take your child's knowledge of football to the next level.